COAA and MBSI are enthusiastically returning to Shupp’s Grove Antique Market, located in beautiful Lancaster County, PA. It is an outdoor antiques and collectibles market and has been in operation since 1962. It is well known as a Pickers’ Market. Our weekend is their Summer Extravaganza, which starts on Friday. Our organs are scheduled to play on Saturday, and Sunday. Sales start at 7:00 am. We will wait until about 10:00, after the initial buying frenzy, to begin entertaining, and will play until about 4 or 5 pm. On our first visit we encountered an appreciative audience and outstanding hospitality. We will hold our regular “Crank Organ Concerts” on Saturday & Sunday afternoon. All owners of hand-cranked organs are invited to gather as a group and play their instruments for both rally participants and the general public. These are always great fun. Shupp’s Grove is a former picnic grove and park which was later a campground. It really is in a grove of large trees with good shade. There is pleasant walking among the sales stalls. 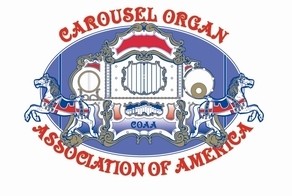 Both large and small organ owners will be assigned a “vendor’s location” within the grounds. Spaces are 15' wide and at least 20' deep. They will accommodate a regular sized vehicle and have (2) 3' X 12' tables. This means all vehicles can be parked in a convenient location. It allows you easy access to your roll collection, multiple instruments, chairs and canopies, etc. Even better, if needed and with caution, you may move vehicles in and out during the day, as vendors do. Small organ owners are welcome to stroll about with their instruments. Friar Tuck's Deli is in the thick of the woods. You will find some great soups, sandwiches, pies and cakes throughout the day, all homemade, of course! Our Saturday evening meal will be held here. The address is 607 Willow St, Reinholds, PA 17569. For Shupp’s Grove information visit their website at www.shuppsgrove.com or call 717-484-4115. We hope that you will join us for another great, fun-filled weekend!